If you're tired of all-white traditional wedding dresses - dip it in some dye or airbrush it. We're not joking! 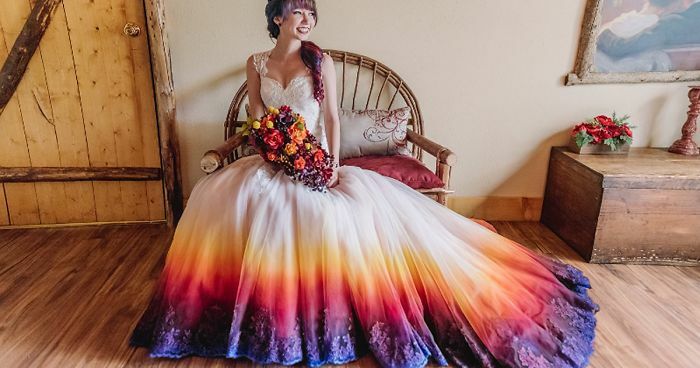 This dip dye wedding dress trend not only gives your formal dress a colorful touch, it also solves one major problem that many brides face. Enyone who has attended a wedding probably saw how dirty the gowns sometimes get from touching the ground. So there's a very practical reason to color the edges. Beautiful colours, beautiful hair, beautiful girl- and I'm sure the wedding was beautiful, too! I love the hidden surprise. 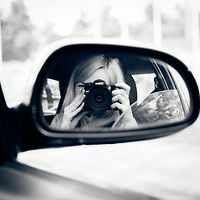 Nice peekaboo! I like the subtle shading very much. I like this the most,and prefer the pastels,pink would also be nice,Hate the first one,the dark blue dress and the yellow one. This one has a stronger tie dye feeling but staying with just one color works! Ariel and Eric 😍 Her hair is amazing! Very nice. Makes me think of a daffodil. Well ain't this a swashbuckling affair of a couple. Notsomuch this one, LOVE the bouquet though. Yes, exactly with that color shoe. It's the perfect complementary color to the pink. Haha, she was doing this 14 years before it was cool. This pic is from 2002! Ooh, this one is cool! Not my color. But her day! she makes a pretty bride!! & YOUR WEDDING IS YOUR DAY, NOONE ELSES OPINION MATTERS ONE DAMN BIT!!!!! The color is fine, it's a nice elegant green, plus it works with her hair and the flowers. It's looking like a sort of nature theme, and she's killing it! This one is very subtle. I really like how the peach/cream blends so well with the surrounding tulle. Not a wedding dress per say, but that is one maid of honor! Lovely trend. I do think less is more in this case, even though the three color one is phenomenal! I'm saying this in the manliest way possible: "These are FABULOUS~!"